Our Terms of Sale Agreement and example of Bill of Sale document. All sales for registrable animals will also include a completed application for MDGA registration. 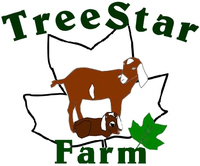 All the livestock at Treestar Farm are raised humanely and given the best of care we can offer. We try to match animals we sell to the best possible home for them so that the buyer is comfortable and happy with their livestock purchase. To hold an animal, a non-refundable deposit of $50 shall be paid as a partial payment towards the animal. Livestock will not be held until the deposit is received. At this time a pickup date will be agreed upon. The buyer shall pay the full balance at the time of pick-up or prior to transportation. Ordinarily a kid is available for pickup at 8 weeks of age. If a buyer wishes to pick up a kid after the age of 10 weeks or an adult more than 2 weeks after the date of reservation, the entire purchase price must be paid at the time of reservation and shall be non-refundable. This is because we cannot serve as unpaid boarders for reserved animals, but allows us to accommodate buyers who need additional time to prepare fencing, housing, or to take summer vacations. Livestock must be picked up by the buyer within 72 hours of the designated date unless other arrangements are made, agreed upon, and documented in writing. Should the buyer not pick up or make arrangements for the animal(s) by the designated date, the animal(s) will be considered abandoned by the buyer and will go back on the market. No refund of fees paid up to this point will be made. Transportation of livestock from Treestar Farm to the buyer is the buyer's responsibility, although we will make every effort to facilitate pickup by buyers or commercial carriers. We do not allow single kids to be transported by commercial airlines. Transportation from Treestar Farm in order to shorten a buyer's trip is usually available at additional cost. Health tests or documentation requested by the buyer (other than dates of disbudding, vaccinations, or other treatment administered at Treestar Farm), or required by the state where the buyer resides, shall be arranged and paid for by the buyer. Livestock listed as “bred” will be pregnancy tested at the buyer’s request and expense. Animal(s) tested and found to be bred are guaranteed bred only as of the date of the test, which will be a blood test run at a commercial veterinary lab. We assume no responsibility for the viability of the pregnancy beyond the test date. Abortion, miscarriage, birth defects, and/or problems of pregnancy are the responsibility of the buyer. The seller does not knowingly sell any sick or infirm livestock without disclosure of such. The buyer may at his/her expense have the livestock vet checked before shipment. Due to the stress of transportation and adjustment to new living conditions, or differences in feed and water, we take no responsibility for the health of the livestock after it is loaded into the transport vehicle. No permanent alteration other than disbudding (such as banding or other methods of castration) will be made to the animal(s) until the full purchase price has been paid to the seller. We do not accept the return of livestock due to possible exposure to diseases. An exception MAY be made in certain RARE circumstances at the discretion of the seller and shall be indicated by the following additional statement on the Bill of Sale: "Buyer and seller agree that goat may be returned within 30 days for any reason, in which case purchase price less $50.00 will be refunded. Valid only if initialed below by buyer and seller. ***PLEASE NOTE REGARDING RETURNS: For reasons of biosecurity, this clause MAY only be included for buyers who have had and currently have no other goats on their property, and will not be purchasing any goats other than those from Treestar Farm within the 30 day return period. Even in these cases, the option for return is at the discretion of the seller. *** We have adopted this policy in order to give first-time goat owners an option that is safe and considerate of the animals' welfare should the buyer realize that they are not able to properly care for their goats. We make no guarantees as to the future height, size, or conformation of immature livestock. Buyer and/or carrier are responsible for the health and safety of the livestock purchased once it is loaded into the trailer or vehicle. By signing below I, the buyer, acknowledge that I have read, understand, and agree to the terms of sale listed above.